This Korg SP-250 review will help you to learn more about the SP-250 and decide if it is the right digital piano for you. Digital pianos are large keyboards that offer you similar benefits that a grand piano has to offer except in less space. Digital pianos are excellent for smaller spaces or for areas that are hard to reach because of stairs and other obstacles. Digital pianos are also great practice tools because they have a memory that allows you to save samples and play along. Usually digital pianos also have a library of music at the ready. The Korg SP-250 is a good example of a reliable digital piano that can be used for both practice and performance. One of the reasons that the Korg SP-250 is good for performance is because it has an enhanced amp system that ensures that the sound is loud enough to be heard in large areas. One of the failings of many of the other models that are on the market is that the sound cannot be heard in larger rooms or areas. Before we get to the review lets go over some of the things you should be looking for when you are shopping for a digital piano. When many people here, the word digital piano they think about the early keyboards that were made of plastic and either had too many keys or not enough keys. Forget those keyboards we are not talking about a plastic toy we are talking about an instrument that mimics the sound of a grand piano wonderfully. One of the first things can pull off the list of possibilities is a digital piano that does not have enough keys or that has too many keys. You want to stick with the 88 keys that mimic the acoustic piano. Going more or less only confuses the situation and unnecessarily complicates practice sessions. Simple is always best if you want to choose a model that is ready to go and that you do not have to spend a lot of time learning about. This is also true of the sound effects and number of tones. A lot of digital piano manufacturers will add unnecessary sounds just so that they can say that the digital piano offers x amount of sounds as a selling point. You really do not need an exorbitant amount of sound effects. You do want some because they are fun but don’t be sold on the sound effects alone. 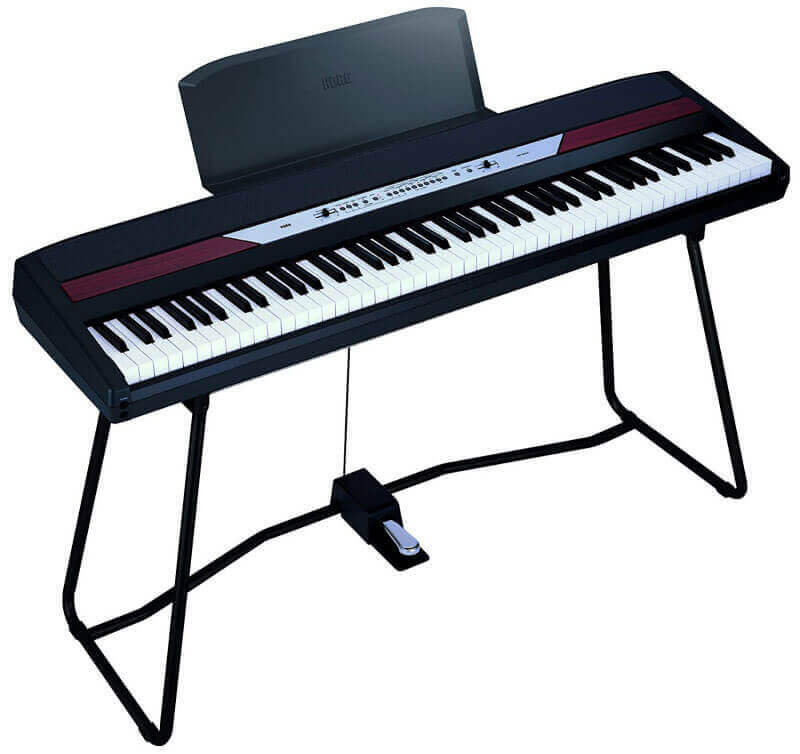 Price point is also a consideration, you do want to get the best type of digital piano within your budget confines. There are plenty of high-end digital piano options on the market that are cost prohibitive for most budgets, but there are also some good affordable options. You do have to shop around for the right price, but it is well worth the effort. We mentioned briefly that purchasing a digital piano is ideal when space is limited or when bringing an upright in to the space would be a challenge but that is not the only reason you want to consider buying a digital piano. When you consider that the Korg SP-250 has not one but two headphone jacks that can be used in conjunction you can see how this can be a very valuable learning tool for practice. Acoustic pianos create beautiful music but you are limited to what type of music you can create with an acoustic piano. A digital piano allows you to get that true to life piano sound but you can also add in the sounds of other instruments or even a choir to get a feel for how the finished composition will sound with other instruments and voices. This of course is also an added benefit for practice purposes. The benefits are clear when you choose a digital piano but there is one more thing that persuades quite a few musicians to choose a digital piano over an acoustic piano. The COST! It can be less than 1/3rd the cost of a traditional acoustic piano. This may be a great solution for a parent that wants to offer music education to their child but they do not want to make the very expensive investment for an upright acoustic. Finally, a digital piano is a lot of fun to play. It is an instrument that brings a lot to the table and can really help to get the creative juices flowing nicely. It is a lot easier to compose when you have an entire orchestra at your fingertips! What Does the Korg SP-250 Have to Offer? Let’s get right to the meat and potatoes the Korg SP-250 offers a good 88 key weighted keyboard to give it a very natural feel. Korg offers a “real hammer” mechanism so you get a very natural feel from the keys making the Korg SP-250 an exceptional practice instrument for anyone that is studying piano. The graded keys will feel very comfortable to anyone that plays the acoustic piano. Of course the RH3 keys by Korg also help the new player to get a feel for the piano in a natural way. In some cases, with digital pianos when the keys are not weighted and graded properly it can actually hinder learning on the acoustic piano. Luckily a great deal of attention and detailing have gone into the keys on the Korg SP-250. As an added bonus the keys on the SP-250 can be adjusted for sensitivity to meet the individual preferences of the user. The Korg SP-250 offers the perfect balance of “extras” without going overboard so that there is not a tremendous learning curve. It offers features like the dual headphone jacks so that both student and teacher can listen in on a practice session. The headphones of course also come in handy when practice is necessary and you do not necessarily want to disturb the neighbors. You can turn the SP-250 into a silent piano practice tool just by plugging in the headphones! It also offers some fun features as well like layering so that you can play multiple instruments sounds at once along with the piano sounds. It offers harpsichord, guitar, reeds and a slew of other instrument sounds that are easy to access and play. The keyboard interface is intuitive and very easy to learn. The familiarity of the keys make transition back and forth between the acoustic piano and digital piano a breeze! Pitch Control can make fine adjustments — play duets in tune with a grand piano! Notice on the features list that this outfit comes complete with a stand so you really have nothing extra to buy but a stool if you choose. The sustain pedal is also included which is another cost savings when you choose the Korg SP-250. It is easily portable which is nice for performance purposes. It offers a nice sleek body which gives it a great stage presence. It is a nice looking and a great performing digital piano from all accounts. The one thing that Korg can do to improve this digital piano is to make it lighter. It is a hefty 33Kg which can be a bit much to lug around to practice and performance so if Korg could lighten things up that would then make this one of the perfect digital pianos. Other than the hefty weight this is a great digital piano that performs exactly as you hope it will. Korg has been creating electronic instruments since the 1960’s. This innovative Japanese manufacturer has produced impressive instruments that are of the highest quality. They are a trusted name in electronic instruments, so it is no surprise that the Korg SP-250 has done exceptionally well in the market place. There are clear advantages to purchasing Korg SP-250 like the weighted, graded keys. Korg has spent a lot of research and development time to perfect this digital piano and to offer a very close match to the acoustic piano experience. If you are in the market for a high-quality digital piano, you can count on Korg to provide you with a great option that is priced fairly and of good quality.